Both are cooked and broiled and both contain some usual share of fat. So with this selection we have pork winning in 3 important categories; namely, Lower in Saturated Fats, Lower in Cholesterol and Lower in Sodium. Though the difference is not so big, the winner takes it all anyway. Besides, it is lower in calories and overall fats. The protein quality of it is also higher, because the quantity of all amino acids is higher. Vitamins comparison Let’s move to vitamins now. Pork is drastically richer in B1 , fairly richer in B2 and E. Considered as very important lately, vitamin D is completely absent from Beef while Pork has 13% of daily value in just 100 grams. On the other hand Beef is radically higher in Vitamin B12 Minerals comparison What about MInerals? Here we have a slightly different picture. Beef is radically higher in Iron and Zinc. Pork is slightly better in Magnesium, Potassium, Phosphorus, Choline while Beef beats pork in Copper and Manganese. Thus, nutrition comparison summary is in a way on the side of pork. In any case it’s definite that it is not worse by the results of surface nutritional analysis. Which is safer for babies ? Actually, many forums still recommend not giving pork to children at the age when they can freely eat beef. Other blogs insist that it is at least as healthy as beef is and recommend it for babies as early as 7 or 8 months old. Looking at the most official source - USDA’s recommendations for babies we can see that both foods are listed together without any reservations and warnings, and both are safe to eat starting from the same age. What makes some think Pork is bad ? What makes some people think that pork is evil then ? Why is it prohibited in many religions and why many of us do not give it to our children for a long time ? There are various statements that some resources keep stating. Please find the more common ones below. 1)Some are referring to processed pork , such as sausages, bacon or salami, while talking about it. Many processed forms may really be dangerous for health but we are not discussing them now and are talking about lean pork such as tenderloin, sirloin chops or top loin chops. 2) Does pork contain more viruses toxins or parasites? As we all know they all die if you cook them with high enough temperature. For that USDA has defined its recommended temperatures for cooking various types of meat. More importantly the recommended temperature is the same for both foods. It’s 145 °F for both, and 160°F for ground meat. So whatever viruses these types of red meat have, they all die at the same temperature according to scientists. 3) Pig is a dirty animal and eats whatever it wants. This partially depends on how the cow, the pig or the chicken are handled on what they are being fed. Grass fed beef really differs from not grass fed one which is a topic for a future article. We should always think of how the animal was fed regardless of the type of meat. And finally, after cooking with USDA recommended temperature we kill all the viruses and parasites as covered in the previous headline. Environment impact National Academy of Sciences published a study in February 2014, which revealed that beef is extremely damaging to the environment. The study was comparing the environmental cost spent to feed and raise animals which are used as protein sources for humans. It showed that cows need around 28 times more land than pork or poultry, require 11 times more irrigation, produce much more greenhouse gas and consume lot more nitrogen. To summarize, cowis damaging the environment 10 times more than any other protein source. Summary It is very important to choose the right cuts of both foods and not use proceed ones. 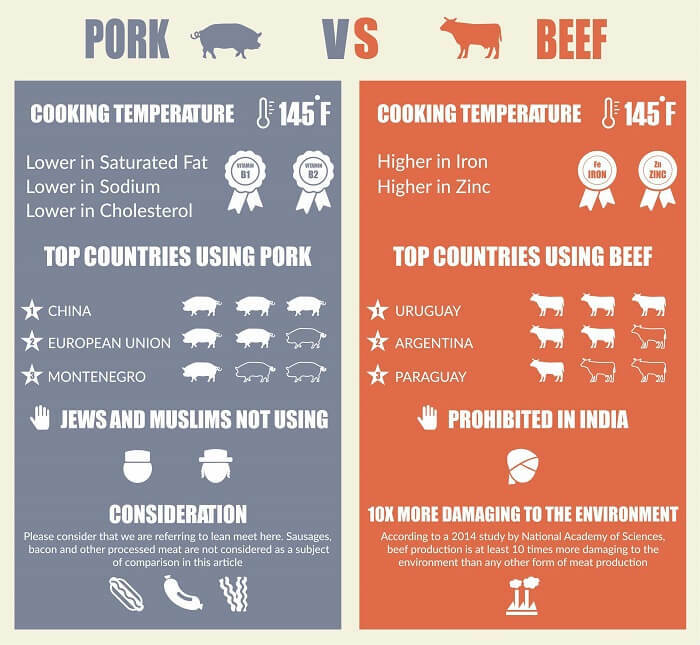 When comparing good cuts of both, pork appears to be slightly better nutritionally, except for the beef being richer in Iron and Zinc. 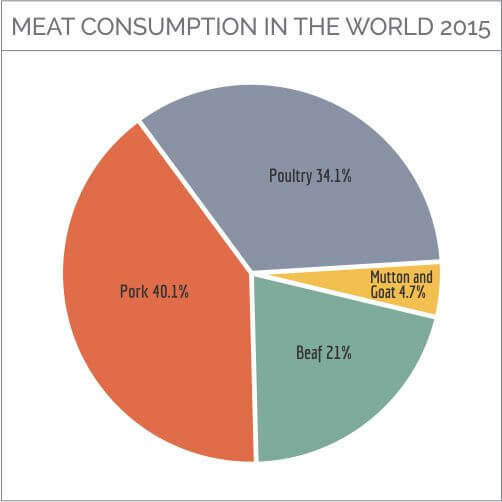 Beef is consumed two times less in the world overall. Various conversations about pork being more “dirty” and full of viruses seem to have no scientific evidence, assuming it is cooked using USDA’s recommended temperature. It’s safe to give pork to children and eat it as long as your religious views allow it. Beef is drastically more damaging to the environment. 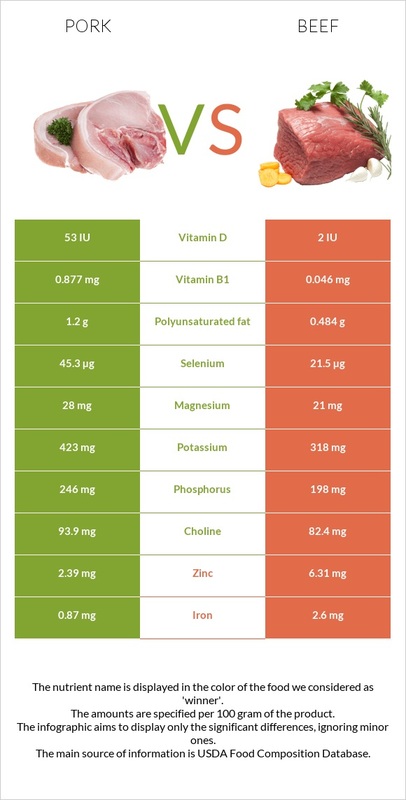 Enjoy and share the comparison infographic and in-depth vitamin/mineral comparison below.